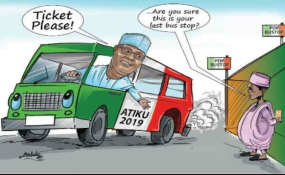 Former Vice President and the Presidential candidate of the Peoples Democratic Party, PDP in the February 23 Presidential election, Atiku Abubakar, today expressed optimism that he would claim what he described as his stolen mandate at the court. Atiku who reaffirmed his rejection of the outcome of the presidential election and his decision to challenge it in the courts has however expressed confidence that there will be justice and the Judiciary would live up to expectation by giving him the mandate as the rightful winner of the election. Speaking yesterday in Abuja when he paid a thank you visit on the leaders and Elders of regional groups, the Northern Elders Forum, NEF, Afenifere, Ohanaeze Ndigbo, Pan Niger Delta Forum, PANDEF, Middle Belt Forum and the Northern leaders and Elders Assembly at the Asokoro residence of former Federal Commissioner for Information and South-South Leader, Chief Edwin Clark, the PDP Presidential candidate stressed that the struggle to restructure Nigeria must continue as the coexistence of the country depends on it. According to him, Nigerians should not be afraid of restructuring as the country had been restructured in the past, just as he thanked the elders for the support they gave to him before, during and after the election. It would be recalled that the Independent National Electoral Commission (INEC) had announced the All Progressives Congress (APC) presidential candidate and incumbent president, Muhammadu Buhari as the winner of the 2019 Presidential election. This week Monday, the PDP Presidential candidate filed a petition at the tribunal, challenging the validity of the election in which Buhari was returned for a second term. The thank you visit by Atiku became imperative because ahead of the Presidential election, leaders and Elders of regional groups, the Northern Elders Forum, NEF, Afenifere, Ohanaeze Ndigbo, Pan Niger Delta Forum, PANDEF, Middle Belt Forum and the Northern leaders and Elders Assembly, had on 3rd February at Sheraton Hotel and Towers, in unison, adopted him as President Nigeria deserves. At the meeting yesterday, Atiku said, "It's my pleasure to be with you today and I want to use the opportunity to thank you for your support before, during and after the elections. "As I had announced earlier, I have rejected the result of the election. As announced earlier, we have filed our petition before the tribunal or the courts because we believe this is a mandate that has been stolen from the Nigerian people. And I believe that the courts will do justice in this case. "We still have confidence in our courts and we believe justice will be done. But the most important thing here is that between ourselves, we have been able to galvanize the people of this country to think alike and in unity. "Of course, we have also come to realize and accept that the basis of our unity, our coexistence lies fundamentally on restructuring this country so that every part of this country can have a sense of belonging and have the opportunity to exploit their human and material resources for the development of the citizens while remaining in the same country. "I, therefore, believe this struggle is a struggle that we must continue together and we will achieve it and I believe it is also achievable. I strongly commit myself to that. And Nigerians don't have anything to fear or dread about the restructuring of this country. After all, we started as a restructured federation and everybody felt at home with that arrangement. "Of course, over the years, we all know how the military has virtually brought a unitary federation. "Therefore, I want to thank you very much indeed for your support. The results we have achieved, particularly myself and the party I represent would not have been possible without your support across the country. "Once again, I thank you very much indeed and look forward to a continued relationship until our objectives are achieved." In his remarks, the South-South leader, Chief Clark who commended the PDP presidential candidate for going to court, however, assured him that the elders were behind him, just as he reiterated that no Nigeria without restructuring. Clark said: "Your Excellency, our president in waiting, because the struggle continues, on behalf of the Southern and Middle Belt Leaders and Elders and the entire preppie of these areas, we welcome you to our gathering. "It shows that we are still together. We want to assure you that we will always be with you. We are happy that you are in court, you have already filed your papers, it's not a question of saying am going to court. We are behind you. And by the grace of God, we will achieve what we are struggling for. "When I said that our struggle continues, what did I mean? That the restructuring of Nigeria is irreversible. No matter whatever method you use, we will continue to be with the promoter of the restructuring of Nigeria until. We want to restructure. No restructuring, it will be difficult together."